When a music buff is murdered, DC Sukey Reynolds (Unnatural Wastage, 2012, etc.) toggles between helping her boss, DI Rathbone, and her boyfriend, reporter Harry Matthews. Lance Rainbird is a man of few words, and most of those show off his vast knowledge of classical music. Many of the ladies who attend Justin Freeman’s musical programs are charmed by Lance, but the men don’t cotton to him. Lance looks down his nose at Romeo, an itinerant singer who makes a living busking and always gives a recital at Freeman's annual musical weekend at the Dallington Manor Hotel. This year, though, Lance isn’t around to sneer at the talented amateur; the night before the performance, he’s found drowned in the pond outside. Newly promoted DI Rathbone, anxious to clear his first case, sends not only Sukey, but DS Vicky Armstrong and two uniformed officers to interview everyone on the scene. The four start off by having coffee while they wait for the participants to be on break. They interview the participants, then break for more coffee before reporting their scant findings to an impatient Rathbone. At home, Sukey treads carefully. She wants to help Harry get a story but doesn’t want to divulge details that compromise the case. Luckily, Harry has a brain wave and invites Sukey to London, where she searches Rainbird’s apartment for clues. When she shares what she learns with Vicky, the two are in a position to reinterview several suspects, after stopping, of course, for coffee. But it isn’t until Rathbone invites the team to his office for coffee that Sukey has one of her famous hunches that allows the team to solve a baffling crime. 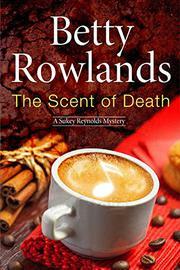 Rowlands might as well have set this case in Starbucks, since it comes from the last inch of the pot.